Leave your worries behind, arrive in Portland for a one-night stay in your choice of 3 wonderful Old Port hotels. Enjoy the sights of Portland before waking up the next day for your first ferry ride in Casco Bay for a one-night stay including breakfast and dinner at the Inn at Diamond Cove. Located on Maine's Great Diamond Island, the Inn at Diamond Cove is a tranquil destination that provides guests with a peaceful and relaxing stay. Constructed during the 1890's Fort McKinley's was part of the country's coastal defense system to protect Portland's Harbor and Casco Bay. 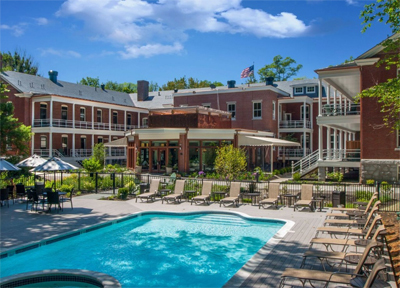 The Inn is housed in Fort McKinley's former Barracks and overlooks the former parade grounds. Cars are not permitted on the Island. Transportation around the Island is on Golf Carts and Bicycles! After your stay on Diamond Island, off on your next ferry to Chebeague Island and the Chebeague Island Inn. The Inn was built in the 1880's and was originally called The Hillcrest Hotel. In the early 1900s, the hotel burned down (ask us about The Legend of Charlie) and was rebuilt in the 1920s. The name changed to Chebeague Island Inn in 2000. Chebeague (pron: shuh-Beeg) is one of Maine's most beautiful islands, currently home to 400 year-round residents, many whose families have been here for generations and many summer families. Wonderful walking trails or a relaxing cocktail overlooking Casco Bay from the inn's porch awaits you. Dinner at this inn is a real treat. After Chebeague it's back to the mainland on your final ferry hop back to Portland. This truly spectacular travel package is available seasonally from late May until early October. Don't wait, call us today and leave your stress behind. **Overnight rates are per person based on double occupancy from Boston North Station and are subject to availability at the time of booking. Prices are based on June mid-week departures. Prices vary by arrival day and travel date. For lowest price, travel mid-week Sunday through Thursday. Friday and Saturday surcharges apply.